The first series of Wainwright Walks with Julia Bradbury is a four-part BBC4 TV series filmed entirely on location in the Lake District. Each episode features Ms Bradbury reaching the summit of a different mountain by following in the footsteps of the famous fell-walker and mountain guide writer Alfred Wainwright. Produced by Skyworks the series includes some lovely aerial sequences of the Lake District and the Lakeland Fells. Unfortunately, each programme only details a single route up each mountain (and not always the best one in our humble opinion) and does not include any information about how to either get back down again or extend your walk having made all that effort to get up there. Furthermore, the series refers to the walk route information detailed in the seven pictorial guides produced by Alfred Wainwright some 50 years ago. Whilst these books are lovely to look at and own (though not cheap at £69.93 rrp for the 7 volume set), they are not great for taking out into the hills and mountains, particularly since many of the details they contain are now out-of-date*. "Guidebooks that are inaccurate and unreliable are worse than none at all and I am aware that in a few small respects, Books One and Two are already out of date." And that was in 1958! provided a list of all the available routes up each mountain for those of you looking for a longer day on the fells or simply to enable you to find a walk that more closely matches your abilities and requirements. 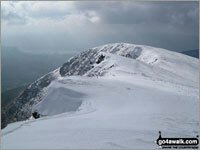 go4awalk.com has detailed walk routes with downloadable GPS Waypoint data up All 214 Wainwrights. We have also produced a series of 7 Peak Bagging Location Maps and Tick Lists by Lake District area (which include all 214 Wainwrights) with room for you to record which summits you have succesfully climbed. With lots of other areas available, they are the perfect planning tool for your next venture into the mountains and hills. Furthermore, if it is your intention to climb all 214 Wainwrights then make sure you check our series of 59 Walks that climb all 214 Wainwrights. The Walks featured in ITV's Wainwright Country with Fred Talbot will be available on these pages very soon. To see the 6 walks featured in BBC TV's Wainwright Walks Series 2 click here. *We are aware that all seven of Alfred Wainwright's Pictorial Guides to the Lake District are in the process of being updated - a job that will take some 10 years to complete. Unfortunately the net result will be a series of books that are still not current, merely less out-of-date!